Screenwriters: Chris Weitz and J. Mills Goodloe, based on the eponymous novel by Charles Martin. Previewed at: Event Cinemas, George Street, Sydney, on 10 October 2017. Fate works in mysterious ways and this is the premise that runs through Hany Abu-Assad’s The Mountain Between Us. Picture this; you arrive late for a flight only to be told that there is no cause for concern because it’s been cancelled, along with every other scheduled flight, due to an impending storm. So, what do you do? Nip around to the local hangar and engage a charter pilot, of course, not worrying when he doesn’t bother to record his flight details with air traffic control because you’ve got an important rendezvous planned that can’t be put off. Oh, and you’re flying over the peaks of the Rockies. Not a problem! From that moment on it’s difficult to empathise with the characters and their perilous situation. Alex Martin (Kate Winslet) is a photo-journalist rushing home to New York. At the check-in counter she overhears a surgeon, Ben Bass (Idris Elba), who’s also anxious because he has to perform a vital operation the next day and is understandably frustrated by the flight cancellation. When approached by Alex he agrees to hire a private plane and they set off into the clouds with Walter (Beau Bridges) at the controls, accompanied by the pilot’s large Labrador dog. Naturally things go horribly wrong and Alex and Ben (okay, spoiler alert here - Walter doesn’t make it) and the dog end up crashing into the top of a mountain range, surrounded by snow, snow and more snow, as far as the eye can see. Alex suffers a large gash on her leg, thus impeding their chances of making a quick dash down the mountain to tree level where they may get phone reception. As the couple realise that help isn’t coming, they must face all the various logistical problems that come with being in frozen, mountainous territory: storms, breaking ice, precipitous falls, hunger and exhaustion and even a mountain lion. 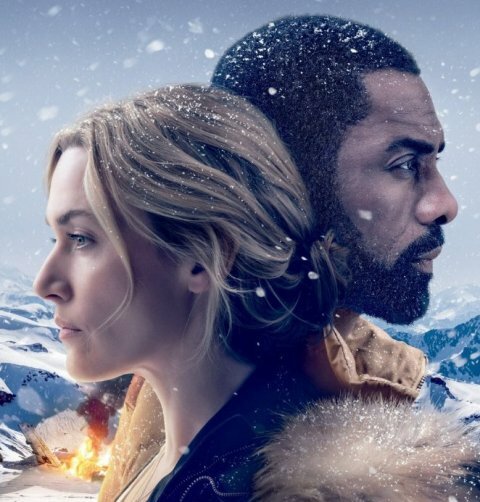 Both consummate actors, Winslet and Elba work well together and manage to turn the rather banal script into something watchable, although there are moments when they look like they’d rather be battling the elements on the sets of better written disaster films like Titanic or Pacific Rim. ​The Mountain Between Us does have a spectacular setting and certainly the plane crash scene will have you gripping the edge of your seat. A rather beautiful score by Ramin Djawadi seems to soar with the couple’s emotions and credit must also go to Australian cinematographer Mandy Walker’s stunning camera work. This is Palestinian/Dutch filmmaker Hany Abu-Assad’s first foray into the realm of Hollywood so here’s hoping that next time around he’s given better material to work with. As the director of the powerful Oscar-nominated films Omar and Paradise Now, it would be a great shame if his work was to get lost in translation, as it were.